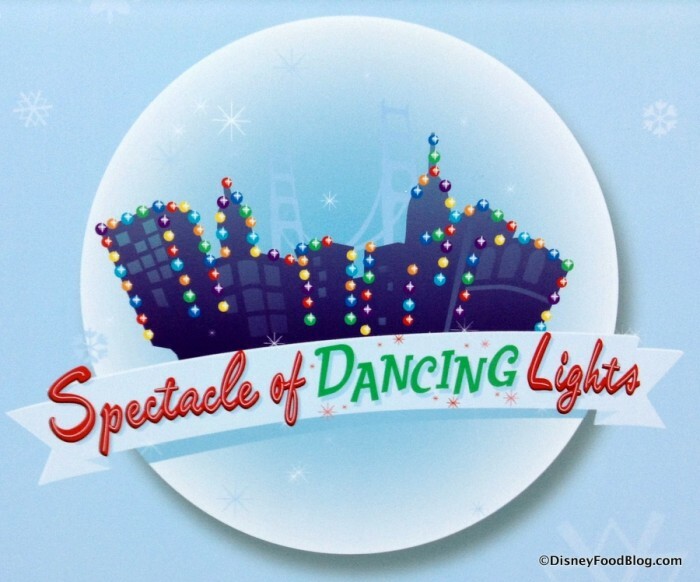 If you are spending any part of this holiday season in Disney World (which has already officially kicked off with events like Mickey’s Very Merry Christmas Party), I’m just going to assume that a visit to the Osborne Family Spectacle of Dancing Lights is on your vacation itinerary. This special holiday event has become even more of a Must-Do this year, with the fact this holiday season is the final chance to watch the Lights dance at Disney’s Hollywood Studios. Before the Lights even come on, though, lots of folks like to stake out their spot on the Streets of America to wait for the moment when the Lights begin to shine. 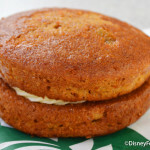 Fortunately, there are some snacking opportunities to help you pass the time with some tasty treats! As always, the Pretzel Garden opens up in advance of the show, serving up… well, pretzels, of course. Churros, glazed almonds and pecans, and a few beverages round out the list. 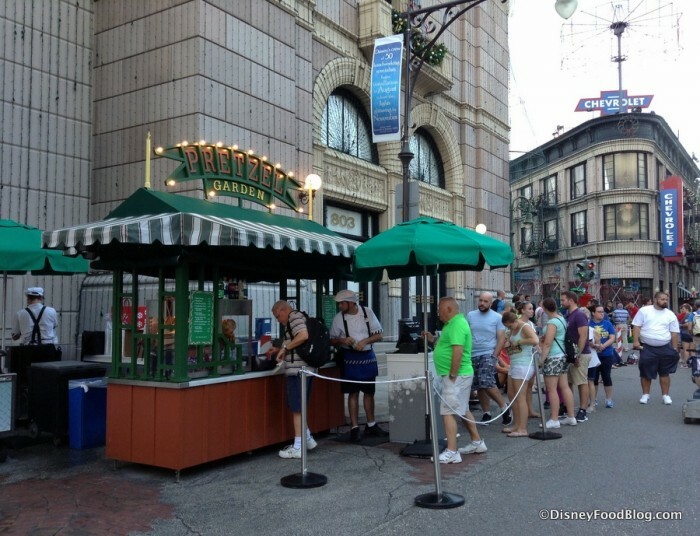 I spotted the ol’ standbys at this little kiosk right away: the Cream Cheese Pretzel and the Mickey-shaped Pretzel. 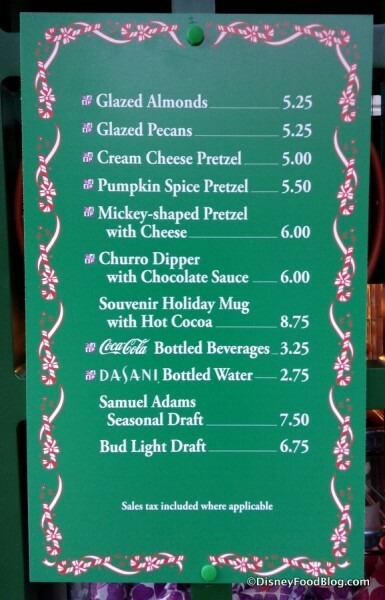 But there was also an addition to the pretzel selections on the menu: the Pumpkin Spice Pretzel. 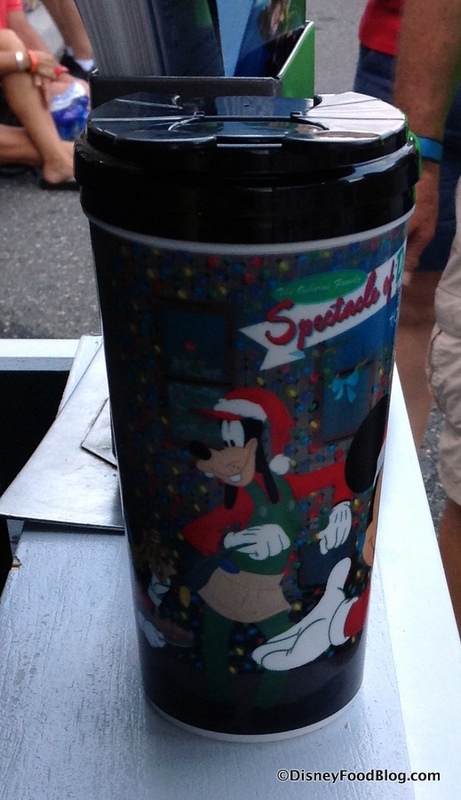 Oh, before we dig in… you may have noticed the listing for the Souvenir Holiday Mug filled with Hot Cocoa on the menu. In case you’re curious about it, here’s a glimpse. It’s complete with a Mickey-shaped flip-top 🙂 . Back to the Pumpkin Spice Pretzel! 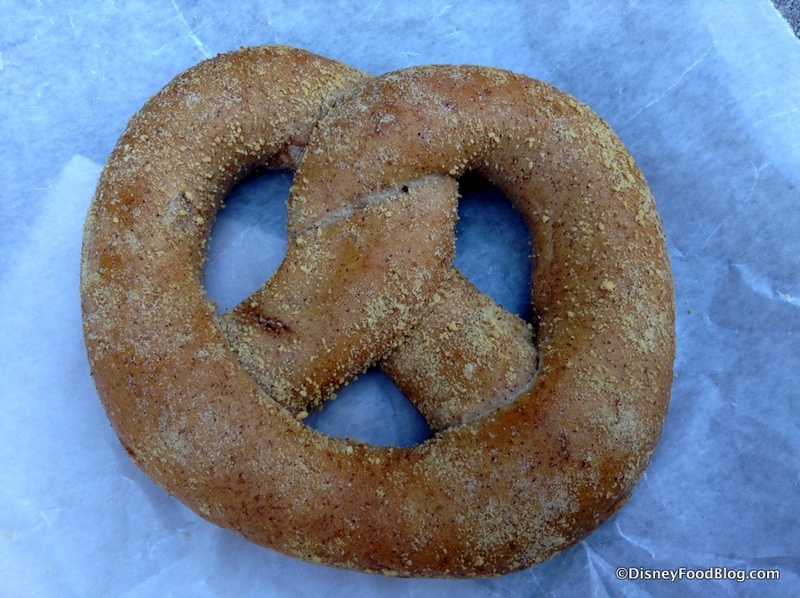 I was expecting the pretzel itself to basically be a typical pretzel dusted with a mix of autumnal spices (cinnamon, nutmeg, clove and such). As it turned out, though, any spice in pretzel bread was quite mild. THAT’S because all of those spices are tucked inside the pretzel… with the help of this pumpkin filling that winds throughout the whole thing! 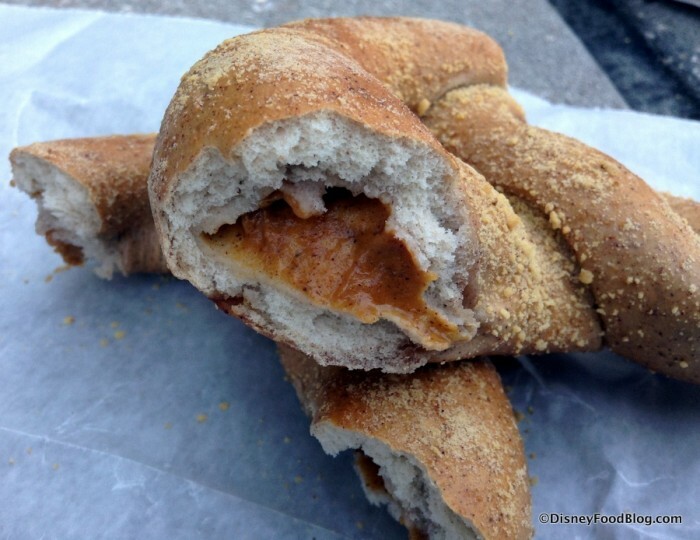 It tastes exactly like pumpkin pie filling (since that’s essentially what it is), only with a less-dense consistency closer to pumpkin puree tucked inside the warm pretzel — close, but not quite as thick as the the Cream Cheese Pretzel, if you’ve ever given that a try. It’s one of the favorite tastes of the holidays tucked inside the typical theme park snack of a soft pretzel — it’s the best of both worlds! For those of you who just can’t get enough of all-things-pumpkin during the Season’s Eatings (or just like the idea of a portable pumpkin pie), this one’s for you! 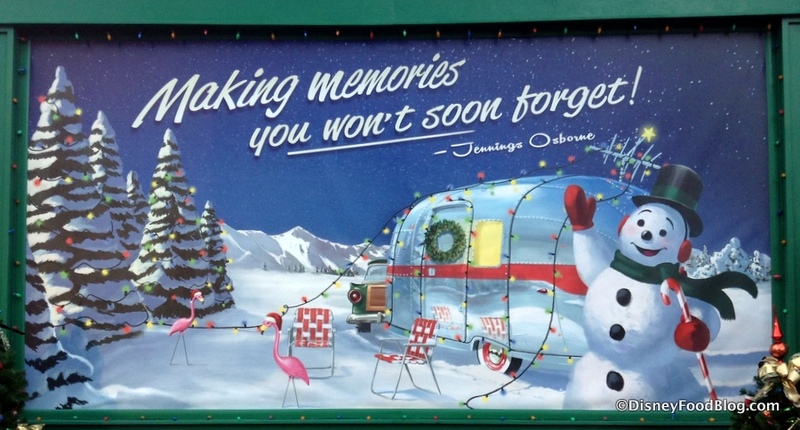 Of course, we’ll be back soon with more from The Osborne Family Spectacle of Dancing Lights for what everyone is waiting for… the moment the Lights turn on! There are a few extra surprises when it comes to eating and drinking during the Lights this year, and we can’t wait to share them with you. Will you be watching the Lights dance this year? Please let us know with a comment! Can I just say a big thank you for this website? 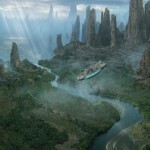 Reading your blog in anticipation for my upcoming trip to DL (haven’t been in a little less than 10 years!) makes me really excited. I love taking little mini notes on what to eat since eating there will be a major part of my trip. So thanks!!! Oh my goodness this will be the perfect snack with some hot cocoa to see the lights! thanks so much for the post cant wait to see more about the lights!!! 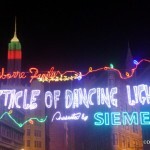 My family planned a trip starting New Year’s Day this year, arranging our trip specifically to see the Osborne Family Spectacle of Dancing Lights! We’re from Arkansas, where the lights originated, so naturally we had to see them! We’ve never been during the holiday celebrations before (usually attempting to visit during less busy times), but we didn’t want to miss our last chance to see the lights! 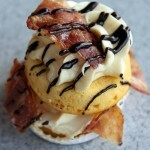 I had the opportunity to try this treat over the weekend, and it was AMAZING. I expected a traditional cinnamon sugar pretzel with pumpkin pie spice mixed in, but found so much more! The filling was awesome, and I was sad that I opted to share one vs. buy my own. 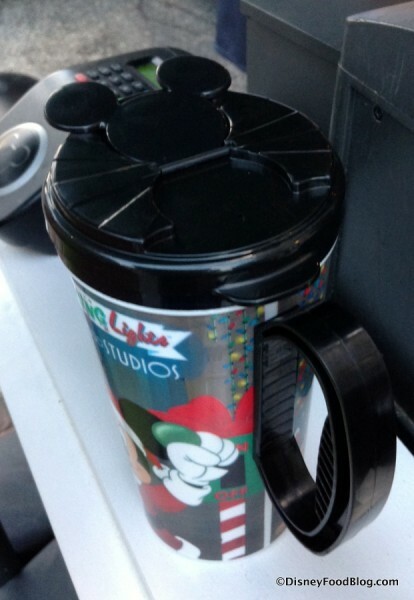 This looks pretty delicious – I’ll definitely be picking one of these up, as well as a souvenir mug. I try not to get too any of those, but that one looks like it’d fit in a cupholder pretty nicely, plus it’s the last year for the lights, so might as well get something to remember them by! 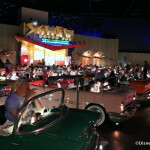 Will you guys be doing a review of the Merry and Bright dessert party? I’ve seen one review that wasn’t such a great one but would love to see your take on it. Thanks. 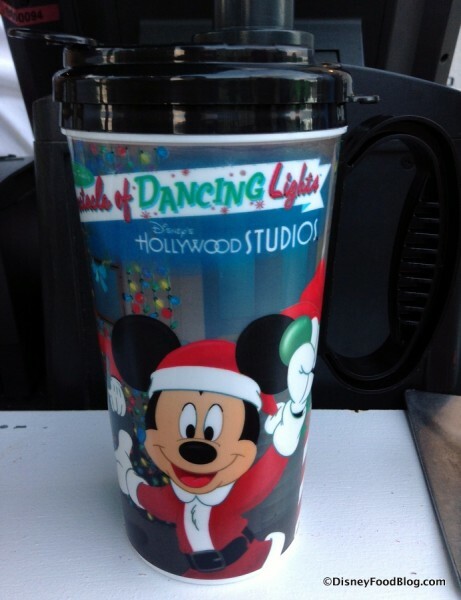 I love the hot cocoa mug. Is gingerbread hot cocoa available this year? Well I’m sold. Definitely going to try that pretzel this weekend! Kathy — Yes, it is! 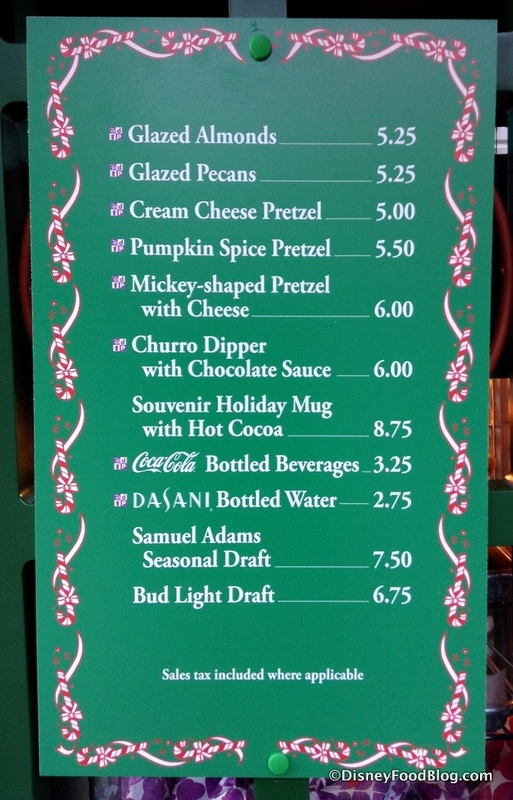 Oh, yeah, we’ll be making our usual stop at this pretzel heaven–and making sure we get a Lights souvenir mug as well. Cream Cheese and Pumpkin Spice Pretzels for the win!